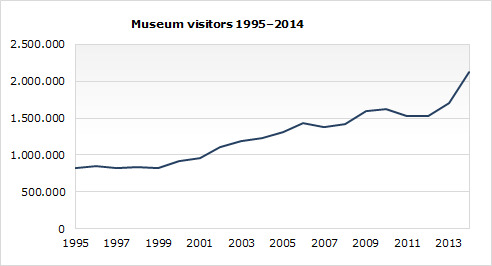 In the year 2014, the number of visitors to museums and related institutions was all time high. About 2.1 million visitors attended museums in the year. This is the first time that the number of guests breaks the threshold of two millions. The increase in number of visitors was roughly 400 thousands from the previous year, which equals 24 per cent. From the year 2000 and onwards, the number of museum visitors has increased appreciably after having been almost unchanged since the latter half of the 1990s. The same applies for the number of museums. It can be argued that the increase in the number of visitors in recent years is due to a growing supply of exhibitions on offer, expanded number of exhibition days, and last but not least to a growth in tourism to and within the country. Attendance to museums was greatest in the Capital region, some 1.3 million visitors last year, which equals 61 per cent of the total. The number of guests in other regions was significantly lower. Most visited were historic museums, six of every ten guests; two of every ten visited art museums and one of every ten natural museums and aquariums and zoos.